UCF scientist Sudipta Seal, whose research has led to groundbreaking therapeutic applications in regenerative nanomedicine, has been chosen as a 2018 inductee into the Florida Inventors Hall of Fame. Seal, who is a UCF Trustee Chair, Pegasus and University Distinguished Professor, is one of seven inventors who will be inducted in September at an annual ceremony in Tampa. 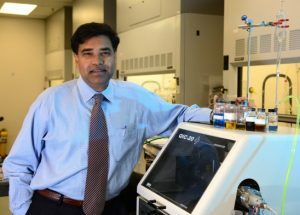 In addition to his therapeutic applications for cancer treatments, Seal also has developed multi-functional nanomaterial additives for aerospace nanoenergetics and his research in power plant fly ash waste has created unique chemistry of ash particles with nanostructures that can be used to clean up oil spills. Seal has 64 total U.S and international patents and is chair of the Materials Science and Engineering Department with an appointment at UCF College of Medicine. He is the former director of the Nanoscience Technology Center and Advanced Materials Processing Analysis Center. The academic units that Seal oversees are continuously creating new inventions and technology at UCF. Seal has published more than 400 journal papers, conference proceedings papers, book chapters, and three books on nanotechnology. Seal is the fourth UCF researcher to be named to the hall. Issa Batarseh, an electrical and computer engineering professor, was inducted last year. He was preceded by M.J. Soileau, professor emeritus of optics, who was named in 2016, and Shin-Tson Wu, a professor of optics, who was inducted into the inaugural class in 2014. The Florida Inventors Hall of Fame recognizes inventors whose achieve­ments have advanced the quality of life for Floridians, the state, and the nation. The hall is at the University of South Florida in Tampa and supported, in part, by the Florida High Tech Corridor Council.